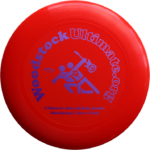 Woodstock Ultimate is a series of casual pickup games, played on beautiful grassy fields with mountain views. All genders are welcome to participate in this flying disc sport. Most Sundays throughout the year we play at 3:00pm. In the summer months (Daily Savings Time), we try to play Tuesdays and Thursdays at 5:00pm. If you are interested in playing Ultimate with us, even in the off-season, please subscribe to our mailing list. Once on our mailing list, you’ll then be able to participate in our per-game sign-up page, which builds momentum and ensures games are viable. * Note: some players are not online, so turnout may be higher than reflected in this signup counter. Participate in our online game sign-up by joining our mailing list. The Woodstock game is played on Sunday afternoons at 3:00pm, and Tuesdays and Thursdays at 5:30pm Sometimes there are games on other, special days. Sometimes people show up a little late, so don’t panic! If you’re new to Ultimate and want some learning and practice, please come more on the early side. 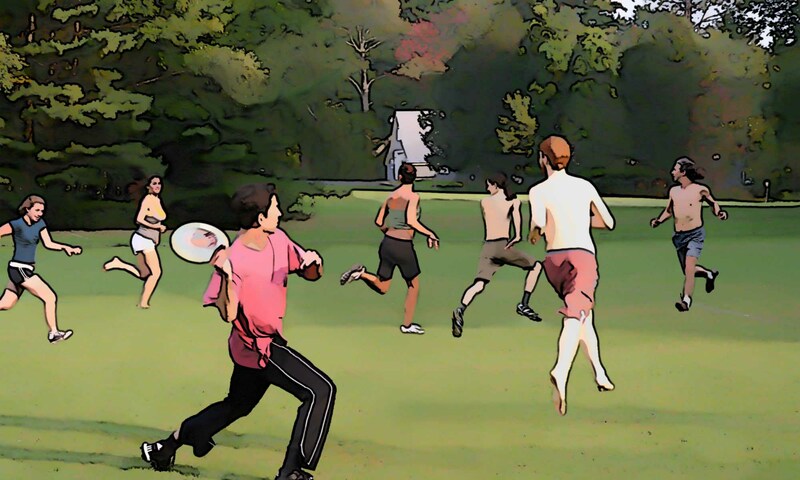 Some of us arrive promptly to the games, and can help newcomers with their disc technique and knowledge of Ultimate. The games are usually at the Comeau Property fields. These are beautiful and level fields, very well taken care of by the town of Woodstock and the soccer folks. Click here for a Google map of the Woodstock Comeau Property. From the center of Woodstock, the Village Green, go West towards Bearsville on Tinker St (Rt 212) until you see the old firehouse on the right. Opposite the firehouse on the left is Comeau Drive. Go up this road, where you’ll immediately pass the first municipal parking lot on the right, and up to the second parking lot at the top. It’s on the right and is covered with gravel. Park in this lot, and go westward through the gate, on the dirt road, and on to the two large fields. On extremely rare occasions the game moves because the Comeau Property fields are wet, or we are bumped because of other Comeau activities. Click here for a Google map of the Woodstock Rec Field. From the center of Woodstock, take Rock City Road (the road that intersects Rt 212 at the Village Green). Pass cemetery on right and park in the parking lot immediately after the cemetery. We play in the Rec Field (Andy Lee Field), behind the Community Center and pool. These games are within 55 miles of Woodstock, as the crow flies. If you know of a local game that's missing from this list, please submit it to the excellent site at PickupUltimate.com. Once it's been entered and approved there, it will appear here automatically. Ultimate is a non-contact team sport, originated in 1968, combining some elements of basketball, soccer, and football. The game is fast paced, and quite a cardiovascular and full body workout, but it is also very easy to learn. There are two teams with 3 to 7 players each. Play starts as one team throws the disc to the other. The other team catches the disc, and begins to move across the field toward their goal, tossing the disc between their team members. A player cannot run with the disc, and attempts to throw it to a teammate while the other team tries to block the throw. If the disc is caught by the other team, or falls to the ground, the other team gains possession and tries to work back towards their goal line. A point is scored when the disc is thrown over a team’s goal line and caught by a team member. 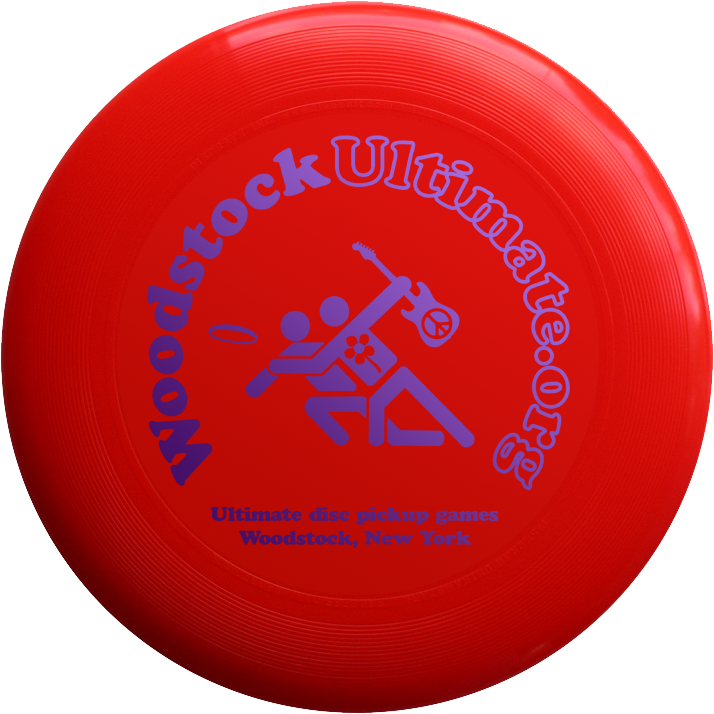 The disc used is a Discraft, Pulsar, Frisbee, or similar disc, with the Discraft being the preferred choice over the traditional Wham-O brand Frisbee. More information about Ultimate rules, and for connections to other pickup games, leagues, and more, please visit USAUltimate.org.